English poet. Author of 'Paradise Lost'. Autograph signature with words in his hand "pro [or pre?] 12s 6d 1634". On paper measuring approx 4 x 2.25 inches (10 x 5.5 cms). Laid onto paper piece and mounted on part of album leaf. Old creases and tears with some paper losses just touching the 'J' of 'Jo.' but with no loss to signature or inscription. After Shakespeare, John Milton is, perhaps, the most celebrated poet in the English language. From 1632 to 1641 John Milton was undergoing a self-imposed period of exile in Hammersmith and in rural Berkshire, where he began several years of intensive private study and immersed himself in reading literary, historical and philosophical works. This was to make John Milton one of England's most learned poets. It was around this time that he wrote his masques Arcades (1632) and Comus (1634 - the date of this signature). This signature of John Milton was probably taken from a book, manuscript or receipt connected with his studies and writing at this time. John Milton published his magnus opus 'Paradise Lost' in 1667, when blind and impoverished. The autograph of John Milton is exceedingly scarce and has always been highly sought after. It is now virtually unobtainable. This example comes with excellent provenance. Provenance: John Nichols (1745-1826) printer and antiquary. Intimate friend of Dr Johnson, Boswell, Horace Walpole, etc. This autograph was contained in an early 19th century album (pages watermarked 1814), the first page of which bears the laid down inscription "These autographs were collected by my youngest daughter Anne Susanna. J. Nichols. Oct 29. 1813". John Nichols was apprenticed to William Bowyer (known as 'The Learned Printer') in 1759 and eventually succeeded him in the business and became the foremost printer of his time. Nichols was editor and printer of 'The Gentleman's Magazine' from 1788. He was an eminent antiquary and amassed a great quantity of literary and historical documents, mostly in connection with his literary works, such as his 'History and Antiquities of Leicester' (1795-1815) and 'Illustrations of the Literary History of the Eighteenth Century Consisting of Original Letters of Eminent Persons' (1817). He was not an autograph collector himself and disposed of his papers by giving many away or by donations to museums. Since his death many of his papers were acquired by the British Library, the Bodleian Library in Oxford and the Folger Shakespeare Library in Washington and many were dispersed by Sotheby's over a period spanning almost 100 years from 1878. He encouraged his youngest daughter, Anne Susanna Nichols (1788-1853), in the pursuit, however, and in a letter to her he wrote: "There can be no reasonable objection to your collecting the Autographs of Persons who have been eminent either for high station or Literary Talent, as the hand-writing is often the index of the Mind; the pursuit is harmless and even meritorious, provided it be made as a matter of amusement and not of business which would be incompatible with the duties of a Female. I never had the leisure, or the inclination to make such a Collection for which during the long period of sixty years I had every Facility, and I now regret that I have destroyed many hundreds and given away many more, which might have furnished for you a rich Collection. I am glad, however, to be still able to add a few names of eminence. . ." Anne Susanna and her brother, John Bowyer Nichols, went on to become two of the 19th century's foremost collectors of autographs, many of their choicest items now being held in National collections. Anne Susanna's nephew, John Gough Nichols was the author of 'Autographs of Royal, Noble, Learned and Remarkable Personages Conspicuous in English History' (1829) which did much to popularise the collecting of autographs. 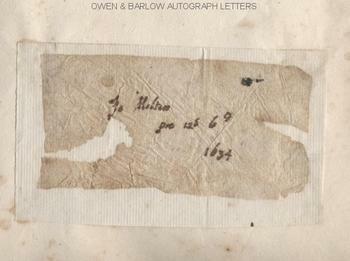 This autograph of John Milton is sold together with John Nichols' laid down inscription from the first leaf of Anne Susanna's album.